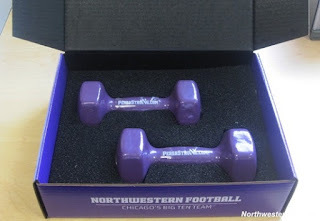 There's no more sure sign of the impending return of college football than the first dispatches of Northwestern media hype products. 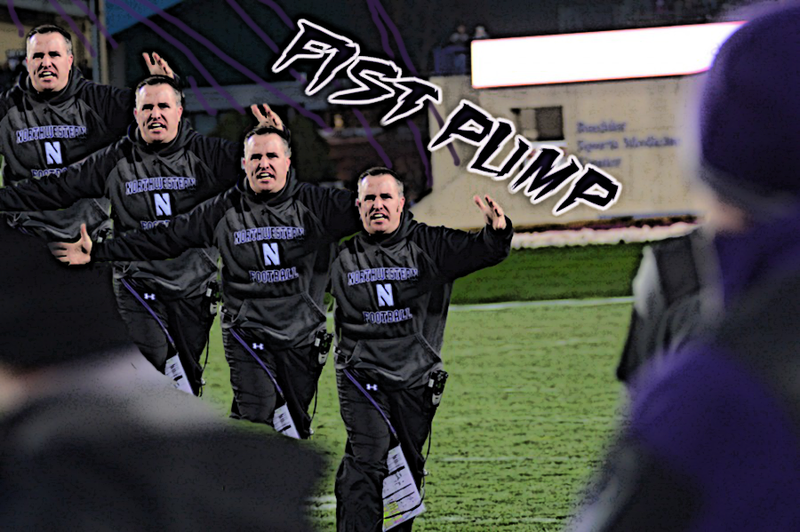 In 2010, the Wildcat Department of Athletic Aggrandizement peppered Chicagoland with billboards declaring Dan Persa "Chicago's [Big Ten] Heisman Candidate" and sent weights labeled "Persastrong" to the media. In 2013, they built a custom Goalpost On Wheels and traveled to regional news outlets threatening to tie reporters to them and assail them with kicked footballs until they agreed to add Jeff Budzien to the Groza Award watch list. 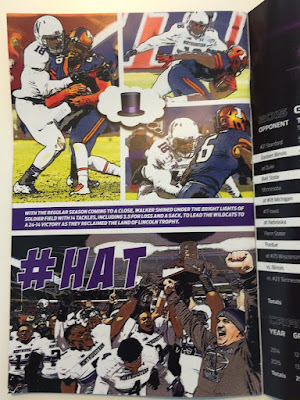 Northwestern promoted the 2014 season with a flurry of pamphlets denouncing unionization. The outsize world of college football should have the heroic exploits of players, coaches, and stodgy commissioners in comic form with an applied photoshop filter aesthetic. 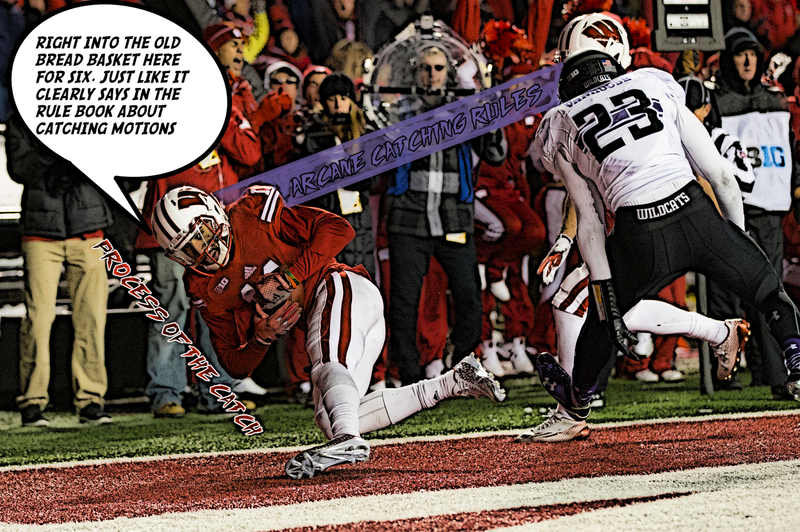 So here is a collection of Big Ten comic panels showing the conference in action outside of Big Ten Network Regional Coverage. BYCTOM Big Ten Comics encourages you to send away for the nunchuk starter kits, x-ray specs that allow you to find BTN2 in your TV listings, a Purdue Pete that grows in water into a figure so grotesque that it could be banned by the government at any time, and special crystals from Rosemont, Illinois that, when configured correctly, will reveal the next eight members of the Big Ten. Please allow 6-8 weeks for delivery. 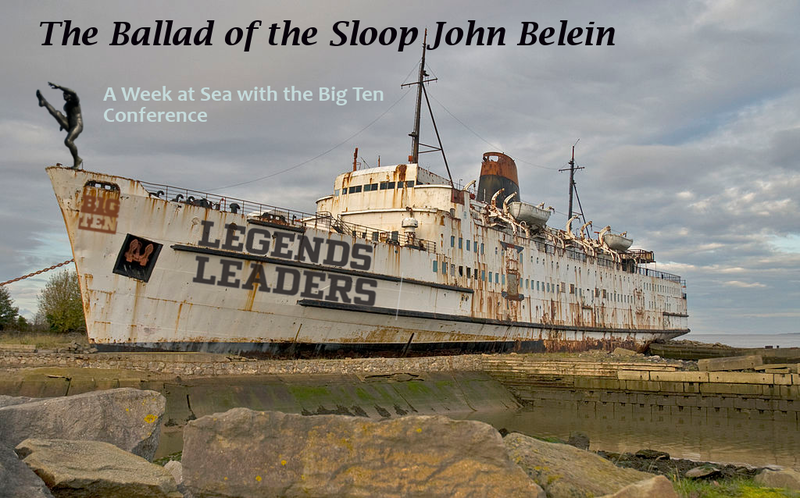 If you are a fan of a Big Ten team, you have no doubt received, alongside ceaseless entreaties for money, e-mails about the Big Ten Alaska Cruise. 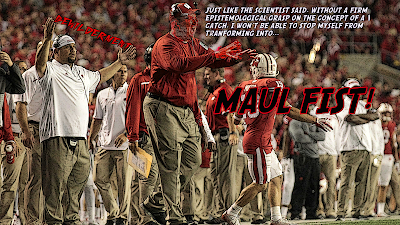 What kind of depravity and hedonism takes place when the stoutest denizens of the Midwest are allowed to run rampant and talk about fullbacks for days on end? BYCTOM and its parent company Amalgamated Anvil and Anvil Lubricants' VIL Blogging Network sent one intrepid blogger to find out. The fan cruise exists as the logical endpoint to fandom; beyond the websites and message boards, conventions, and newsletters, the fan cruise asks if you can enjoy something so much that you are willing to lock yourself on the inescapable sea with 300 equally deranged people. 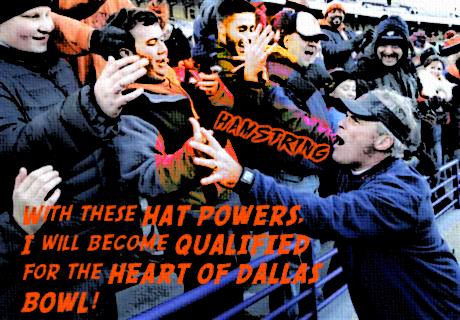 It was inevitable that the same impulse to gather hundreds of fans of comic books or hair metal or “Bones” or Gronkowski torsos would want to expand to football conferences, where fan enthusiasm is based on drunken, adversarial screaming at each other. And it makes sense that the Big Ten ship goes to Alaska, a colossus plodding its way towards the furthest northern reaches of human civilization. With nothing but the sea spray at my back, an official reporter’s notebook in a satchel, and the latest blogging apps, I decided to venture forth with an advanced reporter’s technique called “participatory journalism.” This is same approach that led Hunter S. Thompson to start a motorcycle gang and George Plimpton to join the Detroit Lions and shout things like “sport, if you wouldn’t mind hiking the ball my hand is appropriately close your buttocks, ah well met.” What you are about to read-- edited for length, but not clarity-- is my account of a week at sea on the ill-fated Big Ten Cruise. The Big Ten Cruise is not actually a Big Ten Cruise. It is a special package on a normal cruise ship. 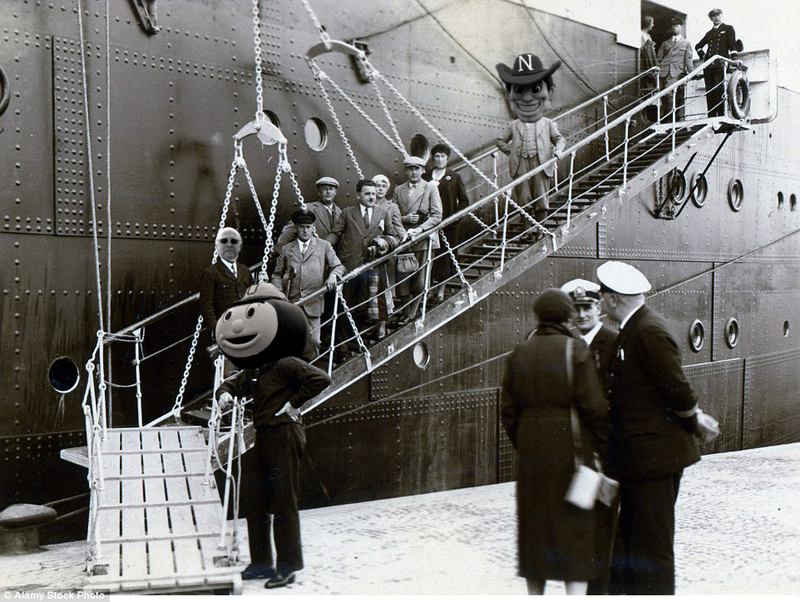 That means there are hundreds of people aboard only realizing now, after seeing Big Ten Ambassador Ron Dayne lowered by crane onto the the ship’s deck, that they have been doomed to endless discussions of sixteen-year-old fullbacks’ 40 times with no possibility of escape. As a members of the Big Ten Cruise Package, we were welcomed to the ship with a medley of piped-in Big Ten fight songs, handed itineraries (preciously referred to as “syllabi”) of Big Ten events, and greeted by a phalanx of mascots. Herky Hawkeye was there. Willie Wildcat high-fived children. I did not see Purdue Pete, but we have been promised that he will appear intermittently in port windows between fleeting beams of moonlight when we least expect it. “‘Head’ of the Class: A Structuralist Reading of Mascotry” from R. Paula Brumaire, Associate Professor of Mascot Semiotics, the Pennsylvania State University. Above decks, the Big Ten fans appear to be integrating well with the rest of the passengers. Without their lanyards and Big Ten apparel, they can roam undetected amongst the other cruise-goers chatting, walking the deck, and scanning the seas for birds and whales. It all seems like normal cruise behavior until a group of seemingly-unaffiliated passengers burst into a melancholy rendition of an alma mater or an unnecessarily aggressive argument about recruits’ ACT scores. At breakfast, the Big Ten passengers were abuzz about the Verne Lundquist lecture later that afternoon. “It’s gonna be special,” said Bert Johanssen who has brought his wife, Bonnie, and his two children Phil and Walter from Blaine, Minnesota. “We’d always wanted to go to Alaska, and never in my wildest imagination did I believe I could see it with Verne Lundquist.” The family sported matching gold Minnesota t-shirts with Lundquist’s head crudely photoshopped onto the head of Goldy the Golpher. 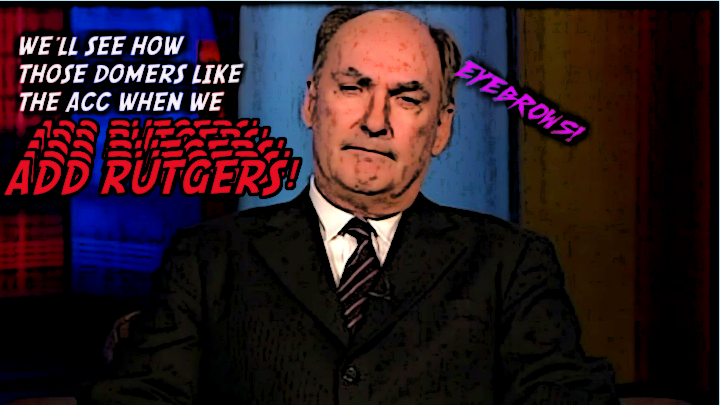 “We’re Verneheads,” he said. 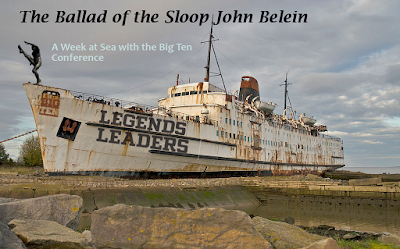 The ship also offers an 11:00AM lecture from Beth Mowins. The Lundquist lecture was packed wall-to-wall. I managed to get a great seat by telling them I was a journalist and patiently explaining the importance of the Fourth Estate in American society and on this ship. But, before the talk could even begin, the ballroom hosting the lecture erupted into chaos. A disheveled man charged the stage. He had no Big Ten package lanyard. His heavy beard had been stained by chewing tobacco. A mushroom cloud of white hair was held up by a battered visor with an orange “I” turned into a B with faded magic marker. He pulled some notecards from his nylon jacket. “Big Ten football,” he said, reading directly from the card. “Well in my house we call it…” he said, trailing off as he desperately rifled through the cards, “Bad Ten football.” A crew member hustled him off stage. The only discernible words he screamed as he was dragged off were “Lincoln hat” repeated over and over. 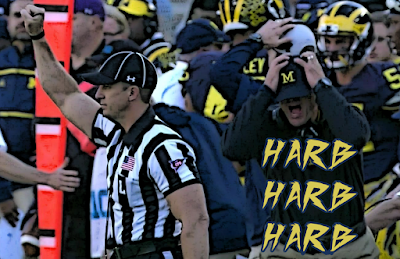 The big draw in the evening was a special screening of the Werner Herzog film “Grizzly Man” with commentary from Jim Harbaugh. Harbaugh was not on the ship; he came to us live from a recruiting visit to a go-cart track. Harbaugh skidded across the finish line and moved his helmet cam inches from his face. “There is no doubt in my mind I would have been accepted into bear society,” Harbaugh said. The trouble began earlier during the Ultimate All Big Ten tailgate. A sudden shudder and jolt on board sent two guys arguing about whether the bean bag throwing game is called bags or corn hole flying into a Big Ten Network-sponsored Rotel pyramid. I grabbed a guardrail and was able to get out of the way of some grilling equipment that managed to topple over and light a life-size cardboard cutout of Tom Crean on fire, his face enveloped in demonic flames. The ship stopped. After a few minutes, the captain got on the PA system to tell us that we had some engine trouble. We had intermittent electricity and were not going anywhere for awhile. I waved over a crew member and told him I was an influential blogger and pressed him for the real story. I even used the phrase “deep background” but he was clearly not savvy around the press, and he told me to "scram" so he could “do his job.” That’s a direct quote; he was willing to go on the record. 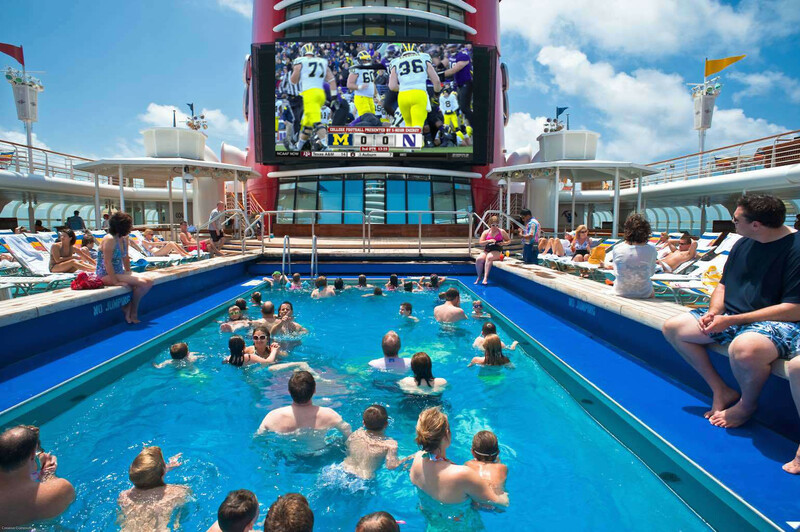 The Big Ten passengers appear disappointed, but remain steadfastly dedicated to Big Ten entertainment while onboard. That evening, I bumped into a group of lanyard-clad fans still in high spirits. They told me that they had convinced Harold Krusp, a history professor from Wisconsin, to give his “Depression America: The Golden Age of Big Ten Football” talk under a flickering emergency light and they invited me to come by. I apologized and told them that I was a journalist in a crisis situation and needed to gather information. I rooted around my baggage and found what I had desperately hoped I wouldn’t need: a khaki vest with dozens of pockets. 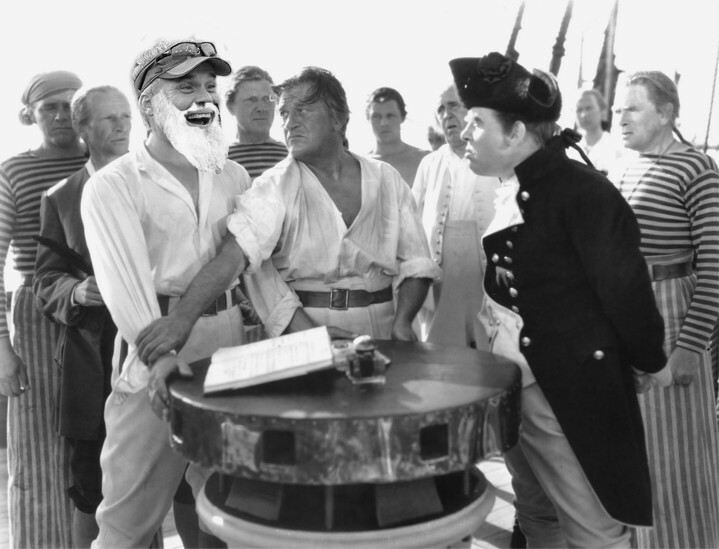 The first few days of the cruise, the ship was filled with chatter about activities and processions of replica Land Grant trophies and Old Oaken Buckets. Now, the tenor of the ship has changed. There are no activities. The passengers spend their time trading gossip and what little snatches of information they can come by. There’s a divide building between the Big Ten group and the rest of the passengers. The Big Ten fans decided to hold a Big Ten trivia contest after lunch, but without microphones the group continuously yelled Curtis Enis across the room, unable to discern whether that was the question or answer. The session ended when a large group of unaffiliated passengers silently surrounded the trivia contest until one of them stepped forward. “We really need you to stop talking about the Big Ten,” she said. For a second day, the ship sat idle. Most of the perishable food has spoiled. This morning, I saw a beefy old man turn away heartbroken as deck hands callously tossed a palette of rotten cheese curds overboard. Information remains scarce and unreliable. The crew has been reassuring us that they are doing all they can to repair the ship; the captain’s grim, stubble-ridden face tells us otherwise, and frustrated mechanics occasionally surface from the engine room. The Michigan Men do not appear to be the only ones planning a mutiny. Earlier, I heard a small commotion and followed the noise. The visored man responsible for the diatribe before the Lundquist lecture had gathered a small crowd around him. I was startled to realize that he was former Illinois football coach Tim Beckman. It appeared that he had used his legendary motivational skills to convince the non-Big Ten passengers that the Big Ten contingent has been plotting against them. He held up a life ring. “Wait, aren’t you the guy who doesn’t believe in hamstring injuries?” one of the passengers asked. “I’m the one holding the speaking ring,” Beckman said. At some point you cannot just be a passive reporter, standing on the sidelines. Some things are bigger than the story. I decided then and there to tell the captain about the multiple plots to take over the ship. As luck would have it, I saw him pacing the deck with a retinue of anxious-looking crew members. I ran up to him to talk, but he told me to get lost and said the next time I tried to talk to him he would use me as a propeller. Little did he know he had fallen for a classic reporters’ trick. “Possible propeller issue,” I wrote in my notebook. We were all pressed together shoulder-to-shoulder to hear the captain tell us definitively what was going on. I had tried earlier in the day to pressure one of my sources, a crew member who had seen me weeping on a staircase after getting rebuffed for a quote, but he told me that he didn’t understand why I needed to know anything before the other passengers. My lecture on the sanctity of the First Amendment fell on deaf ears. So there I stood, sandwiched between Hal and Carole Mitchell from the Quad cities, straining to hear the captain. That’s when the drums started. At first, it blended into the clanging and whirring of the futile engine repairs over the past several days, but eventually it broke through with the unmistakable cadence of a Big Ten drum line. It was Beckman, with Big Ten streamers tied into his beard leading a small but desperate-looking band of mutineers towards the bridge. He was carrying a giant rolled up canvas; his followers wore decorative helmet snack bowls on their heads. They banged on plastic goalposts pilfered from the remains of the tailgate. The crowd instinctively parted. I fell in line behind them with no regard for my own personal safety and drew a fresh pen from a vest pocket. “Captain, I think you should step aside before you send us all to a watery grave,” Beckman said . “This,” he said, shaking his canvas scroll like the Cecil B. Demille Moses, “this will get us to shore.” His supporters fell into a reverent silence as he unrolled it. It was a sheet with a crudely-drawn Big Ten logo with the universal circle-slash “no” symbol drawn over it. He held it aloft. Beckman blankly stared at the faces surrounding him. Even his most ardent followers pointed their goalposts and aimed their pop-a-shot basketballs at him. He scampered away from the crew, grabbed a giant inflatable Lil’ Red mascot, and leapt overboard. Together, with equally maniacal grins, they drifted towards the horizon. With that, the cruise was over. 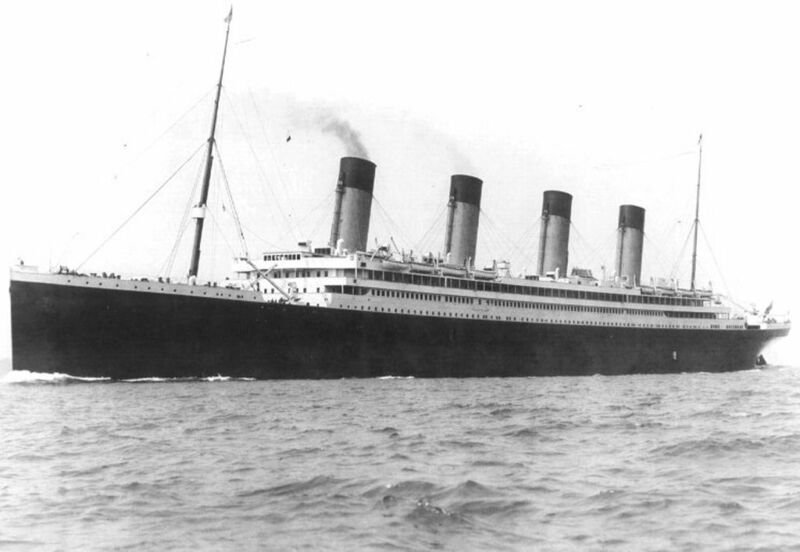 The captain told us the ship could not continue in its current condition. We would have to be towed to shore. A small but defiant group of Big Ten fans steadfastly clung to the Big Ten experience. All evening, they gathered in a circle, clutching the children, telling tales of past Big Ten glory. “Kunle Patrick tipped the ball right to Sam Simmons. They called it Victory Right,” said one purple-clad man miming a tip drill. “Son,” said another, looking at a group of children, “let me tell you about Ron Zook.” A man in an Iowa shirt walked up to the crowd as they yielded the center of the circle. He looked each of them in the eye, his voice quavering. “Robert Gallery,” he said. The tugboats eventually arrived and pulled us to the closest port in Ketchikan, Alaska. The ship had been running out of food, lost the ability to deal with passengers’’ waste, and had become marred by growing strife between the Big Ten passengers and the rest of the ship. One particularly irate cruise-goer toppled a life-sized talking Gus Johnson bobblehead that could not be stopped from wheezing out a chilling “RISE AND FIRE” death rattle for hours. It took days for everyone to sort out their travel plans and make their way back to Seattle. Once in town, I did some extremely journalistic digging on the status of the ship by calling the cruise line’s customer service number. They told me the ship had not been fully repaired in Ketchikan and would be towed back to Seattle. I went down to the port and asked around and, even though no one would answer my questions because I had clearly discovered a conspiracy so diabolical that they would stop at nothing to prevent me from unearthing it, I eventually figured out that the date of the ship’s arrival was posted on a website. I stood on the pier and waited when it appeared-- first as a shimmering white dot then coming fully into view. A few other Big Ten fans, still clutching their lanyards, still clad head to toe in colorful university apparel, had come by as well. 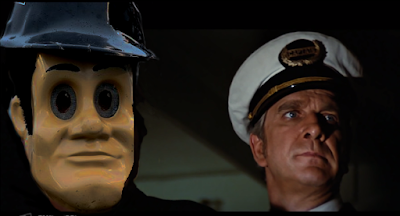 They stood there, half in awe, half in mourning, watching the Big Ten boat limp into port, coated in sewage and stale tortilla chips, still upright, three yards at a time. The best parts of Face/Off are when Nicolas Cage, playing a heroic FBI agent who had his face swapped with his sworn enemy using biotechnology and Windows 95, realizes that he has become, to the outside world, his own archnemesis and the only way to cope is to adopt his enemies' criminally insane behaviors, thus becoming what he hates-- and to show this internal emotional conflict by making extremely Nicolas Cage faces. This also describes what the Chicago Bulls have done this offseason to their bewildered fans. It was not enough for Gar Forman and John Paxson to send the faces of the team to New York and subject Bulls fans to maniacal Joakim Noah dunk screams in the hated uniform of John Starks and Patrick Ewing. They also signed Dwyane Wade and Rajon Rondo, the Bulls' own archnemeses. Every time Wade grabs at his eye imploring the refs to call a foul or Rondo sourly walks away from Hoiberg in the middle of a timeout and then gets in a tiny scooter and just drives home in the middle of a game, Chicago fans will instinctively start to boo them only to realize they are on the Bulls now and so they are forced to imitate Cage's simultaneous weeping and maniacal leering out of sheer confusion. and blowing up vehicles at each other for 138 minutes. The qualified Per Synergy Sports basketbloggers can explain better than me how Wade and Rondo make no sense for the Bulls. Neither fits with Hoiberg's pace and space philosophy that exists on a chalkboard somewhere in the bowels of the Advocate Center. Wade shot less than 16% from three last season; Rondo does not seem willing to shoot under any circumstances and appears to be modeling his game on the time Ricky Davis futilely shot at his own basket to get a triple double. It has been about two weeks since Gar Forman justified the Rose trade by claiming the Bulls would get younger and more athletic. Now, he has acquired two players in their thirties with a history of knee problems. But that is immaterial. The Wade and Rondo moves are disasters because they the are two of the Bulls fans' most hated NBA players and I hate their jerk faces. Rondo's crimes against the Bulls date back to the epic 2009 Bulls/Celtics playoff series when he threw Kirk Hinrich into a table like a professional wrestler and bludgeoned Brad Miller about the face. 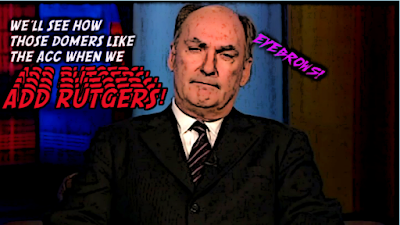 A wobbly, dazed Miller could not hit his free throws. Compounding the humiliation, the primary video evidence of the hit has been uploaded by a person named "patsfan000026" with NOT FLAGRANT superimposed on the bottom of it in such an obnoxiously-implied Boston accent that my computer has become infected with a virus and screams about Tom Brady being railroaded at random intervals. Rondo managed to quit on a playoff team in Dallas so egregiously that they pretended he was injured. His time on the Sacramento Kings, less a basketball organization than a boiling cauldron of insanity, climaxed with an ejection for screaming homophobic slurs at a referee. The most interesting subplot on the Bulls this season will be the ways that Rondo manages to psychologically break Fred Hoiberg, who coaches with the intensity of a substitute math teacher. Perhaps Rondo will humiliate Hoiberg in Connect Four in front of the entire team. Perhaps he will convince Ol' Fred that everyone on the team is growing mustaches in November and then when Hoiberg walks into the advocate center as the only person with a mustache he is greeted by pictures of Ned Flanders plastered to the walls with a legend that says "HOIBERG." Maybe Rondo will re-edit Hoiberg's game film, switching out the coach's beloved inspirational '80s movie scenes for horrifying Cronenbergian body horror while Hoiberg yells C'MON YOU SAID YOU NEEDED FINAL CUT PRO FOR FILM STUDY at him. Wade has, as far as I can tell, never used a part of the arena to attack Kirk Hinrich. 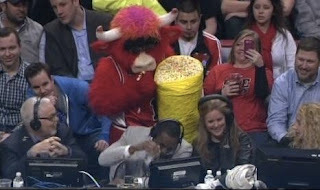 Nevertheless, he earned the ire of Bulls fans as the ringleader of the hated Heat. Wade feuded with the Bulls when they had Ben Gordon and Ben Wallace and he feuded with Derrick Rose before Rose's knees disintegrated like the guy who drank from the wrong Holy Grail. Wade's sins are more prosaic than Rondo's. He flops. He moans at officials so operatically that opponents easily dunk on the next possession because the NBA doesn't allow players to assign ghost players to defend while they are berating Scott Foster. More than anything, Wade has existed as a very good player on a team that consistently beat the Bulls for more than a decade, the grossest basketball evil that can be committed against a team. 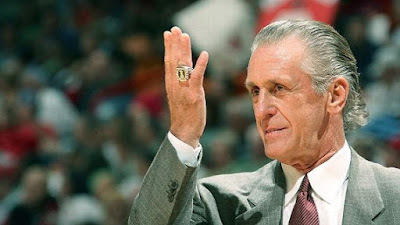 At the very least, the Wade move has backfired on Pat Riley. Riley, a basketball innovator who invented advanced strategies such as telling Anthony Mason to elbow people and telling Alonzo Mourning to elbow people, has been irritating Bulls fans since the 1980s. Now Riley has seen his carefully-cultivated Miami family narrative upended by a power play gone awry, which should give him something to think about as he sinks into the hair gel sarcophagus he sleeps in every night. Miami has cap room, but it will be useless if Riley's hard bargaining tactics scare off potential free agents. It is at the very least gratifying to imagine Riley striking out with big name free agents and then angrily feeding some flunky to the shark he keeps in his mansion to use as a metaphor for winning. Sports fandom represents, at best, a crude pantomime of emotions for fans. Players can be gone in an instant, teams removed at the stroke of a pen, and all of the billions of dollars for pyrotechnics and jumbotrons and irritatingly peppy people walking around asking a seven year-old to name their favorite player for a t-shirt and television networks and guys in suits who are paid unfathomable sums of money to scream KEVIN DURANT IN MY OPINION IS NOT MAKING A MAN'S MOVE, KEVIN I AM LOOKING AT YOU NOW AND YOU SHOULD BE ASHAMED, CHAGRINED, I AM GOING TO THROW HARD-BOILED EGGS AT YOUR FAMILY KEVIN and absolutely all of it is completely and utterly devoid of meaning. We can accept that and yet we will turn on a Bulls game to see the sneering face of Dwyane Wade and disgruntled surl-mugging from Rajon Rondo and wonder how this all happened. And when the Bulls play the Knicks next season, against Joakim Noah and Derrick Rose, we'll all feel as if we've seen the faces swapped, the tenets of basketball villainy undermined, the United Center filled with doves. In an entertainment product as insane and capricious as professional sports, perhaps the most reasonable way to cope is to make Nicolas Cage faces and embrace the chaos.